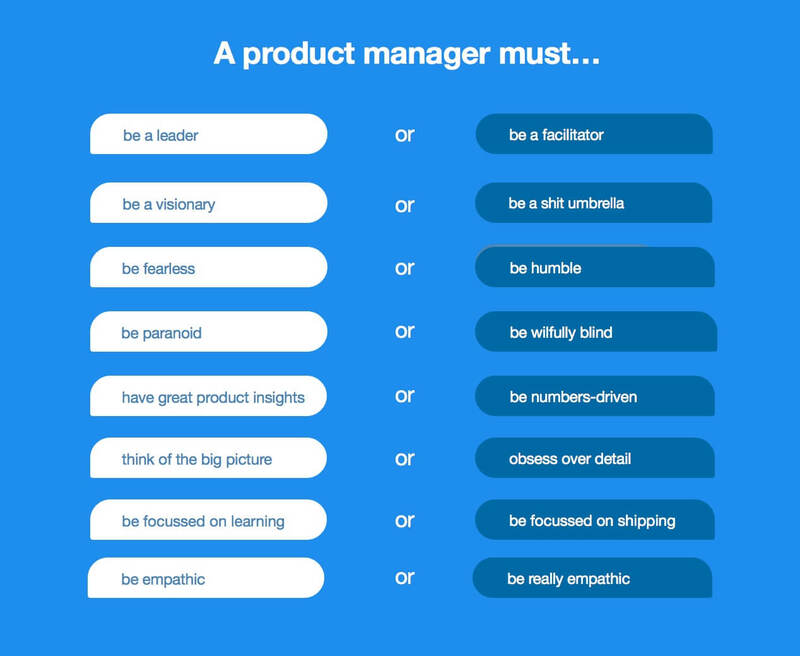 Lots has been written on what attributes help define a great product manager. When you put them all together, what emerges is actually a list of contradictions. That last line isn’t a mistake. The only thing the majority of product managers seem to be able to agree on is the need for empathy. You need to truly understand your customer’s goals, motivations, and pain. Only by having a deep understanding of your customers’ jobs-to-be-done can you unlock the potential of your product. Right? But being empathic can sometimes be an Achilles’ heel. It’s possible to be too focused on your users. You can be too sensitive to their feedback. You can feel their pain too acutely. At the time when you ship a product or feature, a PM actually needs to be stubborn. Stubbornly positive; stubbornly enthusiastic. You’ve understood the problem, you’ve understood the constraints, and you’ve worked through a variety of solutions with the team, making trade-offs along the way. Being empathic shouldn’t blind you to the realities of product management. There are always competing users and interests, and it’s your job to weigh up the options, make a decision, and stand by it. You can’t build a great product without making some customers unhappy. Continual compromise guides you straight to mediocrity. So when user feedback comes in, you need to be stubborn and thick-skinned. You have to give your product a chance to work; for customers to get over change aversion; to let the value of your changes settle, and not just give in to their initial reaction. You have to watch the numbers, not just listen to the feedback. And then, very quickly, you need to return back to a state of intense curiosity and empathy. Maybe you did get it wrong. Maybe you didn’t consider several important scenarios. Maybe your release was a blunder. You need to digest the feedback and weigh it all up again. I’ve learned this the hard way. When we launched our real-time Messenger, we included audio feedback when users send and receive messages. The update really upset a small number of customers. They hated it so much, they turned off the Messenger on their site completely. We moved quickly to appease these customers, and provided a setting to disable audio alerts. Since then? Only a meager number have disabled the audio setting. In retrospect, I shouldn’t have rowed back on my original vision. I should have stood my ground, and not been so sympathetic to a small number of customer’s snap judgments. A PM needs to be a chameleon who willfully changes their personality to match the stage the project is in. Early on, empathy is critical. But later on, it can be a handicap. The art of product management is timing that role reversal just right. The best product managers are those who are able to seamlessly move between these different phases, adapting their mindset and skillset along way. Being empathic or being stubborn. Just one more on a long list of product management contradictions.